Doyle&apos;s The Disappearance of Lady Frances Carfax (1911) is a unique mystery novel. Dr. Watson finds himself entrapped in the midst of a crime scene and is utterly helpless until the arrival of Holmes. 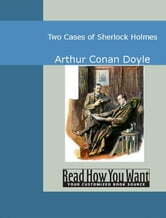 But even Holmes is not able to solve the mystery smoothly. With last minute escapes and hair splitting events the blunders they commit may cost a lady her life. This EasyRead Comfort Edition has been optimized for readers who do not need large type yet prefer a print that does not strain their eyes.